"I found this among some recipes my husband's aunt sent me. I tried it once, and it became a family favorite immediately. I save it and use it in the summer when beans are freshest. Then we always have something to look forward to each summer. I often double this recipe just to have enough for my children to have leftovers! You can prepare this ahead of time, but make sure that the casserole is at room temperature before baking. I often use a mixture of both green beans and wax beans in the casserole." Preheat oven to 325 degrees F (165 degrees C). Lightly grease a 2 1/2-quart baking dish with a lid. Place the green beans in a large pan with water to cover; bring to a boil and cook only until the beans are hot and bright green, about 1 minute. Drain. Transfer to a large bowl. Cook the bacon in a large, deep skillet over medium-high heat, stirring occasionally, until evenly browned and crisp, about 10 minutes. Pour off all but 1 tablespoon of the drippings. Return to the heat and add the green onions; cook until the onions have softened, about 2 minutes. 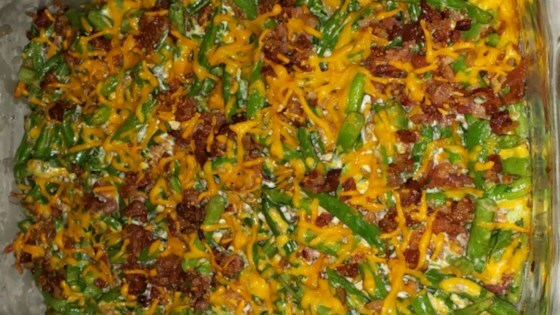 Add the bacon mixture, Cheddar cheese, sour cream, mayonnaise, salt, and pepper to the green beans; stir. Spread the mixture into the prepared baking dish; cover with the lid. Bake in the preheated oven until the casserole is bubbling and the beans are tender, about 20 minutes. This was really kind of inedible and tasteless. I probably won't make this again. I had to make a separate recipe for my husband because he doesn't like mayo or sour cream. Great way to disguise veggies! Rich flavor, much more interesting than cream-of-something soup. Our new favorite green bean recipe for special meals! Way better than the traditional green bean casserole!! I didn't use the bacon though. Very yummy and a great change up to the green bean casserole. Awesome!!! Thank you for sharing, this is definitely a keeper. I should have made a double batch! I did use 2 cans of sliced green beans. Very good. I like the taste of this a lot better than regular green bean casserole. I used canned snap beans but followed everything else exactly. Very delcious.